Yes! Salad Mix! Our very last planting of salad greens made it to harvest! The leaves were small enough to survive some wicked weather (hail, hard rains, and freezing temperatures) a few weeks ago (which wiped out our second to last batch of greens and is the reason you haven't had salad for so many weeks) and we are so VERY hopeful they will make it through what lies ahead of us this weekend and the coming weeks as we draw closer to the end of the CSA season. Such a bonus to be harvesting salad greens grown outside this late in the season. We have had some beautiful weather lately! Wonderful for growing great Fall produce! I was surprised several times this week to find that some plants are still giving us a bounty of goodness. I was hoping to get enough cucumbers so everyone could have at least one - there were well over 100! I thought we'd get a measly last picking off the fillet bean plants this week and call it good for the year - the plants were loaded with beans and they are still producing blossoms! All around the farm, I can see the plants have enjoyed this stretch of sunshine and warm nights. I admit to enjoying it myself. A lot! We have not yet set a date for the end of the CSA season. In our sign up papers, it says we go through the middle of October. I know we will have deliveries through October 14th, at least. Maybe the 21st, depending on weather, the condition and quantity of food remaining, and the availability of our Workshares. You can see from above, that some items are done for the year, but there is still a LOT of great food to harvest. I've had some questions about some of the crops we usually grow. Shell peas - yes, Shain planted a long row but they didn't grow to production. The plants are about 12 inches tall, it looks like they tried to blossom, but then that's it. One long row of stunted shell pea plants. Dill - It's also quite stunted. Most plants are about 6 inches tall. Usually they have grown into small bushes by now and have gone to seed (which people buy for making pickles). We will start cutting the small plants soon and enjoying the little bit that they gave us. Broccoli - a favorite crops for so many members, but it also struggled this year. We planted broccoli at least 4 times this year. Most of it was eaten in the transplant stage by grasshoppers. Everyone will get some broccoli, but not a lot. Cauliflower - same as broccoli, but just starting to produce heads big enough for harvest. golden beets - it's a lot of work for us to leave the tops on, so we hope you are using them! Like I said before, I'm keeping very careful track of those items that are rotating between pick up sites. *All the greens on the farm this time of year are winding down. Each week is a big "IF they are okay to harvest". Our main priority are the fall crops and root vegetables. But we like to have something green in the share too, so we keep trying. Wow! What a difference this nice weather and enough helpers made this week! Some of the shares bags were so full they were difficult to tie closed (had to use twisty-ties). Forecast is for a week or more of sunny skies and warm nights. It's going to help things grow and keep our spirits up a little longer as we continue our weekly harvests into October. I feel like I need to start mentioning that there will be some changes coming to EverGreen Farm for our 2016 season. We aren't sure what this means, what we will change, who it will impact, or any specific details. Over the past month, we have had multiple reminders that this farm business is precariously operating on a very delicate balance between the amount of work that needs to be done (for the current size of our CSA) and the amount of help we have available to do that work. When it's not in balance, our personal lives take a hard hit. It's one thing to be passionate and love what we do, it's another to be so busy and tired that our quality of life suffers. We talk about being a "sustainable farm", now we need to look at how this also applies to ourselves as the farmers. So proud of this great share of veggies! And we still have several weeks to go! 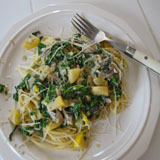 Swiss chard - last of the season? It's been CrAzY around here lately. Without going into a lot of detail (or whining too much) lets just say there was a mountain bike crash (Shain), major health issues with a family member (Shain's dad) that has preoccupied our time and sent Shain out of town for several days, wind damage to a greenhouse (see below), and several other things we've been working around to keep our farm and family intact and operational. So grateful for those who have been extra helpful and supportive lately, especially those who showed up just when we really needed you. Some good news is that we got the Yukon Gold potatoes dug up last Saturday. I'm very glad the potatoes are out of the ground, especially relieved as I sit here listening to the pouring rain and see that it will be like this for several days. This is one less thing to think about. This is what I came home to after CSA deliveries last Wednesday. The plastic on greenhouse 6 (the "big tomato greenhouse") had been ripped wide open and well over half the interior scaffolding was exposed. Our best guess is that a wind burst blew inside the east end doors with enough force to inflate the plastic so suddenly that it tore the metal anchor brackets out of the base boards along the north wall and then ripped the plastic where it was anchored to the east wall. There was nothing I could do but take pictures (which I posted to Facebook to vent my frustration) and wait for Shain to get home to help. Approximately 1 hour later the wind had blown the piece of plastic back into place which gave us a head start on putting things back together. Meanwhile, I was receiving offers of help from a neighbor and CSA members who saw our situation via Facebook. Our first goal was to reinstall the base board brackets and get the bulk of the plastic anchored back down before it got too dark. We also noticed the anchor brackets on greenhouse 5 were hanging on by a thread, so these were reattached as well. By this time it was too dark to do much else. Thankfully the temperatures that night were above freezing so we weren't as worried about leaving the remaining repairs for the next day. We double-covered everything in the greenhouse and hoped for a mild, uneventful night. The northeast corner was the most badly damaged and the original plastic simply wasn't salvageable so I patched in a scrap piece of plastic with clamps, packing tape, and a lot of patience! I'm still pretty proud of myself for this repair job! #GoFarmerGirl I slept so much better that night! Here's to hoping it will last the remainder of the season. Recovering this greenhouse has now become a top priority. Sadly, it will be an expensive and very time consuming project. It's so easy to focus on all the that is going wrong, the problems, the stress, and exhaustion. But this simply won't do! Even with everything that has happened (and we are currently dealing with) there is still a beautiful harvest of food going out to feed so many wonderful families. This is our passion. I'm very glad we made it through another week, not the way I planned, but we did it. We have a crew of great helpers who deserve a good deal of this credit. And thanks to all of you for supporting EverGreen Farm. Broccoli to Afton this week - it will rotate to other locations as available. Cabbage to Jackson & Alpine this week - will rotate as more grow big enough to harvest. This whole "rotation" thing may see odd to you, but there's a good reason why I do this- with some crops, especially those that come as a single unit (like broccoli, cabbage, cucumbers, etc.) sometimes there just aren't enough to go to every CSA member all in the same week. For example, there were about a dozen heads of broccoli that needed to be harvested this week. It's not practical for me to attempt to divide 12 broccoli between all the CSA members, so I give them out to the pick-up location with the number of shares that most closely matches the numbers I have available, give or take a few. Then I keep track and hope next week's numbers turn out a little differently so I can give broccoli to another group. It usually works out in the end. We got a good freeze here at the farm last weekend. Decided to take the covers off the zucchini and squash plants and use them elsewhere. It was time. They served us well. With several nights of freezing temperatures behind us now, the squash and zucchini plants are very dead. So are the potatoes, which I plan to start harvesting this weekend. The only other plants that are obviously damaged are the top leaves of the fillet beans, but it shouldn't effect yields. This is what all of our greenhouses look like at the end of each day. Row covers on everything! It takes about 1 hour each evening to put them on and close everything up for the night, including hooking up a few heaters in greenhouses where the most sensitive crops are growing. Then about 1 hour every morning to uncover and open everything back up, including switching all the extension cords back to the fans which get turned on around noon because clear and sunny skies means it can get very hot in the greenhouses. Whew! It's a busy time of year! I'm looking forward to 5 days of nicer weather - and a few extra hours of rest. Two weeks in a row without salad mix in the shares and folks are asking if we will have any more this season. The truth is, I don't entirely know. The lettuce greens are growing outside, which makes them subject to the weather, bugs, weeds, etc. I can tell withing 15 minutes of cutting greens if it will be worth our time and effort to continue and harvest enough for the CSA shares. I started cutting off a new row of greens this week, but so much of the tops were dead and wilted (result of a hard freeze) that I knew it wouldn't work this week. We are very happy to know so many people love our salad greens, but it's just that time of year when fall crops are ready for harvest and they take a priority over preparing one very time consuming item we've had almost all year. 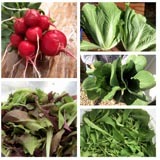 And with that said, this also applies to some of the other greens that we've had all season - kale, chard, and collards. The plants have given us a good harvest all season long and they don't look so great. They could be done any week now. Dug up ALL the Red Norland potatoes this weekend. 500 pounds! We've certainly had bigger potato yields, but this is still a good crop considering the plants were stressed and stunted on some freezing nights back in June. You'll have red potatoes for a few weeks in a row until we get the Yukon Golds out of the ground. Some recipe recommendations for enjoying this week's share: Leek and potato soup; potato, bacon, kale soup; "new" red potatoes with peas; and roasted beets and potatoes with parsley. Yummy! Looks like we have another cold front coming in, with at least one night dipping into the high 20's. Yuck! Double Yuck! Then with a series of freezing or near freezing nights just before and after. So, this means pulling out all the row covers (again! ), plugging in heaters, and closing things up tight at night. We will concentrate our efforts inside all greenhouses as this is where the effort will pay off. Outside crops that don't like the cold will probably be goners anyway. Good timing though with the peas, they finished up this week. Yukon Gold potatoes will die but they need to get dug up ayways. Carrots won't mind the cold, they'll actually get sweeter! Salad mix is iffy, sometimes it looks okay again a few days later. Meanwhile, we have a LOT growing in our 7 greenhouses. Cabbages are starting to get big enough to harvest. French fillet beans will be picked next week. I see a LOT of baby broccoli. The leeks and onions did quite well this year. I think this is the best beet crop I've seen in a few years. I know, I know. People want to hear about the tomatoes. About half the plants are less than a foot tall. The bigger plants are full of green tomatoes. Nothing grew over 4 feet tall this year. I don't really like to talk about it. Pepper plants are mysteriously pitiful as well. Maybe a dozen plants grew a foot tall. The rest are short and doing nada, de rien. I suggested to Shain that we stop trying to grow tomaotes and peppers and use the valuable greenhouse space for something more likely to produce well. He said he wants to try a few things differently next year. He's determined to grow an abundance of these heat loving crops like we used to.